I'm afraid I haven't done a very good job keeping up with a weekly entry on this blog, but I've been just buried in engine and car preparations and really haven't had the time to write. But in any case, the plan for this year's Drag Week is coming together now. My high riser for the Mach 1 will be on the dyno this weekend, and I finally got my CP pistons for my big SOHC, so they are going to the machine shop tomorrow. I hope to get the parts for that engine back from the shop in about a week, so that as soon as the high riser work is done I can get going on assembling the SOHC. I have my pals who are going with me this year lined up to help install the engines and get the cars ready for the track, and I've scheduled some track days in August to try to sort out the Mach 1 and the Shelby clone, plus get my friends NHRA licensed in the Galaxie. Its going to be a busy month, but as long as there are no big surprises, it still looks do-able to get all three cars to the event. Whether the Galaxie will be able to run or not remains a big unknown, but we are planning on taking it down there regardless. Will you be building clone trailers for the other cars? I'm awed by the effort required to prepare one car, simply can't imagine getting three together. Looking forward to more details when time allows. Good luck! Wow, your HR looks great!! 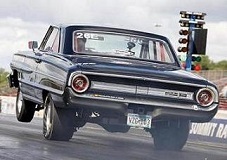 The HR goes in the Mach and so what engines go in the Shelby and Galaxie? Both get a SOHC? I'm modifying an old trailer that I have for use as a second Drag Week trailer, so hopefully we can get that finished up before the event. If the Galaxie makes it into the event as a participant, we plan to rent a small U-Haul trailer to carry the tires and fuel for that car. The Mach 1 gets the High Riser, the Galaxie has the 519" SOHC, and the Shelby clone is getting the big SOHC. Quite the FE contingent! Sounds like you'll have a lot of fun. Boy, you sure are a one heck of a workaholic! I'm sure it's hard enough for most competitors to field one car at a time. It had better be fun, or I'm going to regret all this LOL! LOL with three trailers and three "close friends" that could reduce the need for lets say three jacks, three 1/2" drive ratchets, etc., etc..
Will you be building clone trailers for the other cars?